As a novelist, I have given considerable thought to what the Spartans in the Age of Leonidas might have looked like, as well as how they would have groomed themselves and dressed. From comments and correspondence, I gather that this is a topic of interest to many of my readers as well, so I thought it might be worth some joint speculation. In terms of physical build, I have not heard of any archeological evidence based on skeletons, but would welcome any information you may have heard or read about. In the absence of such forensic evidence, I remain dependent on mixing ancient sources with modern experience and common sense. 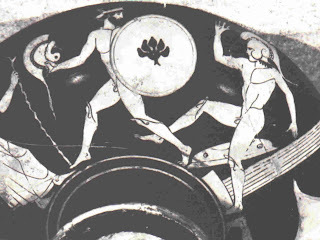 Plutarch, the less reliable source, writes: “The aim of providing [Spartan boys in the agoge] with only sparse fare is that they should be driven to make up its deficiencies by resort to daring and villainy. While this is the main purpose of their scanty diet, a subsidiary one is claimed to be the development of their physique, helping them in particular to grow tall. When people over-eat, their breathing is labored, thus producing a broad, squat frame. In contrast, if breath suffers from only slight delay and difficulty and has an easy ascent, the body is enabled to develop freely and comfortably. Good looks are produced in the same way. For where lean, spare features respond to articulation, the sheer weight of obese, over-fed ones make them resist it.” (Lycurgus:17). 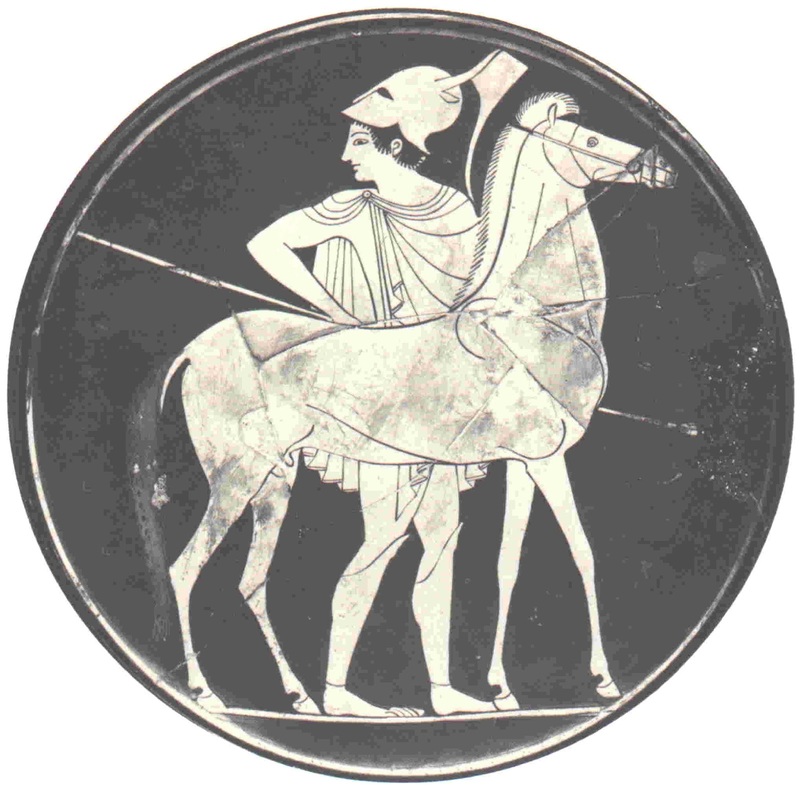 It is startling the way Xenophon’s explanation of why the Spartans restricted the diet of youth to the necessary is focused on virtues very useful to an effective army in the field, while Plutarch’s speculation is more about cheating and “villainy.” Indeed, if one follows Plutarch’s reasoning, Spartan youth didn’t suffer any deprivation at all because they simply stole what they didn’t get in their official rations and the clever and better they were at theft, the fatter they would have become, defeating any “secondary” aim of improving the physique. Notable, however, is despite the different explanations of why the Spartans instituted a regime of sparse rations for youth, both authors suggest that it produced “tall” and (in Plutarch’s case) handsome men. Modern science, however, proves that too little food in fact stunts growth, not the reverse. Clearly the ancient commentators postulated a causal effect where there was none, but such a thesis would presumably have been based on two known facts: that Spartan youth ate less than their Athenian etc. 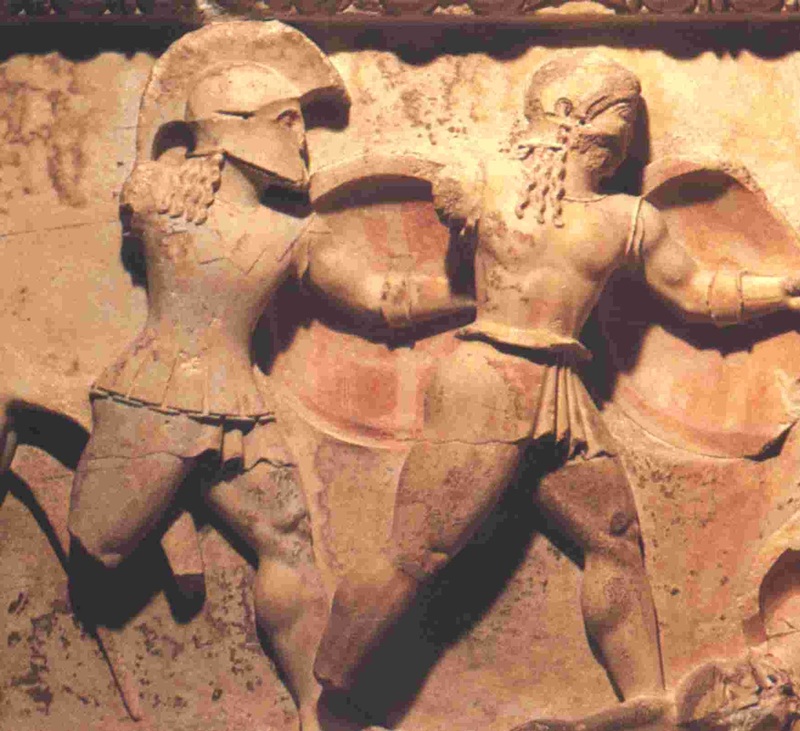 equivalents and Spartans were, on average, taller than their enemies. Returning to the theme of physical appearance, however, we clearly have a reasonable indication that Spartans were on average notably taller than most of their contemporaries. Since the ancient explanation (they received too little to eat as children) is implausible, we need to look for other possible explanations that would make the thesis (Spartans were generally taller) credible. Here the experience of modern Japan might be a useful corollary. As long as the Japanese diet was dependent almost exclusively on fish for protein, the Japanese were notoriously short; the introduction of meat led to the average height in Japan skyrocketing by roughly a foot in just two generations. 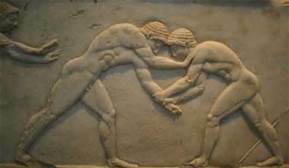 If we remember that fish was the preferred food in Athens and the most readily available protein for all the island Greeks, while Spartans were envied for their rich pastures and game-filled forests, I think it is fair to postulate that the Spartan diet was more meat heavy than that of their major rivals. It is reasonable, therefore, to picture Spartans as unusually tall by contemporary standards. It would be wrong to conclude, however, that they were broader as well as taller than their contemporaries. On the contrary, the ancient commentators stress that Spartans were slim, something they attributed to the fixed rations at the syssitia. Yet men who are too tall and too thin would have been incapable of marching long distances or fighting exceptionally well in a phalanx. So we are talking about lean, not skinny, men. While it might be tempting to picture a Spartan in his prime looking something like a linebacker, I would caution that Sparta’s military successes were not solely a function of Spartan troops being able to push harder, but also march more rapidly (and move at night) and to cover difficult terrain. Likewise the emphasis on hunting, particularly for men in the reserves, suggests to me that Spartans were not excessively “top heavy,” but rather lithe and fleet of foot as well as broad shouldered and strong-armed. In conclusion, I postulate that Spartans had an all-round athletic build developed over decades of physical activity from sports and hunting to military drill and combined with a healthy, but protien-heavy diet that made them tough and lean but not stocky. Turning to grooming, let me start by dismissing modern artistic depictions of Spartans that show them as shaggy, unkempt men with scrawny, chest-long beards and wild, tangled hair hanging to their shoulders alà Richard Hook’s illustrations in Osprey’s The Spartan Army. Likewise, I reject descriptions such as those of Otto Lendle, who describes Spartans as stinking, filthy and slovenly. These images contradict the historical record and existing archeological evidence. In addition to these sources, the admittedly dubious Plutarch claims Spartan men took particular care of their hair especially in the face of danger, and refers to an alleged quote from Lycurgus that long hair was preferred because it rendered a handsome man better looking, and an ugly one more frightening. Whether the locks depicted in ancient sculpture were in fact braided or plaited is not possible to tell from the stylized nature of the evidence. However, it is physically impossible to keep long hair in neat, orderly strands when engaged in sports and other strenuous activities unless it is carefully confined in some way. Thus, practical modern experience suggests that Spartan men did braid their hair, something that is consistent with – though not definitely proved -- by the archeological evidence. Braiding has the added advantage of being something that can be done quickly and alone if necessary, or done elaborately with help. Thus it could have been a means for men to express individual taste and personality within the rigid limits of the Spartan prohibitions against displaying wealth in dress or personal ornament. I personally like to think of conservative, “old-fashioned” men just braiding their hair to keep it out of their faces, while the “dandies” of Spartan society creatively braided their hair at diagonals or in crossing patterns etc. – as in Africa today. This gave a man a great deal of freedom for individual expression – all without breaking any taboos about the use of jewelry or other ornaments. "while Plutarch's speculation is more about cheating and "villainy"." To be fair, I do not summarily dismiss this. One must consider . . . the Helots. From everything I've read -- including your own essays, Professor -- Spartan men and women could not . . . grow their own food. They wouldn't know how. So, call it "scavenging," or call it "foraging," this "villainy" would no doubt be important to Sparta men on campaign. So, while I wouldn't think it entirely the case, I wouldn't discount this particular function of the training. After all, it is highly unlikely that Xenophin is going to "brag" about how Sparta taught its young men the art of "stealing." No people are ever honest about that. Fascinating speculation. I think your conclusions on general "physical type" are likely correct. The builds of decathletes in the first three quarters of the 20th century would likely be very good models to go by as well. Now, as to how tall the Spartans may have been? That is a relative term, yes? 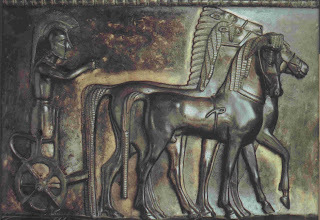 Iron Age Greeks were not -- and correct me if I'm wrong -- as tall as modern Western men. Ethnicity: do you cover Iron Age Greek ethnicity elsewhere? That's a subject in and of itself. Thank you! Regards ethnicity, I must admit I don't feel I know enough to even speculate. A Persian Slave - An Excerpt from "A Heroic King"